Pioneer of the electric guitar and "father" of multitrack recording, overdubbing and the electronic reverb. "For my whole career, all the things I’d done, nothing impressed me as much as just playing in a little club. " “The Wizard of Waukesha” took up his first instrument, a harmonica, at age eight. By 13, he was performing. 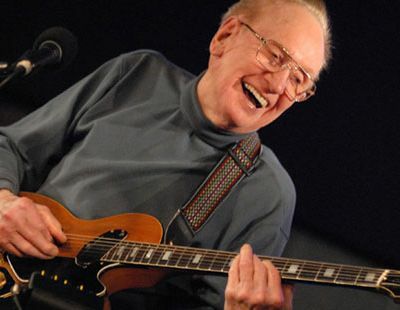 His incredible trajectory is thoroughly explored in AMERICAN MASTERS Les Paul: Chasing Sound. Here are some highlights from his life and career. Lester William Polfuss is born June 9 in Waukesha, Wisconsin, to parents George and Evelyn Polfuss. Punches new holes into his mother’s player piano rolls, achieving a crude multi-track effect; learns harmonica from an itinerant ditch-digger; builds a crystal radio set and begins weekend studies of sound electronics with WTMJ radio engineer. Receives first guitar – a Sears, Roebuck Troubadour; performs in Waukesha as “Red Hot Red;” meets idols Gene Autry and Pie Plant Pete touring with Chicago’s WLS Barn Dance shows; experiments with amplification and electrified guitar at Beekman’s Bar-B-Q; builds first disc-cutting lathe with Cadillac flywheel and dental belts; attempts first “solid-body” guitar, using a railroad track strung with wire and a telephone amplifier as the pickup. Joins Rube Tronson and his Texas Cowboys for a summer gig in Escanaba, Michigan, and befriends his mentor and guitar tutor, “Sunny Joe” Wolverton. Drops out of high school and teams up with Wolverton as “Sunny Joe” and “Rhubarb Red,” performing for “hillbilly” radio stations in Springfield and St. Louis, Missouri. Rhubarb Red and Sunny Joe move on to Chicago to perform at the World’s Fair and then with WBBM, until Paul decides to pursue jazz – living a dual identity as Rhubarb Red on daytime radio and as Les Paul at night, jamming with the jazz greats. Forms the Les Paul Trio with Ernie Newton and Jimmie Atkins; makes Decca blues recordings with Georgia White; and begins the first of many solid-body guitar experiments, paying the Larson Brothers $15 to build a single cutaway half-inch maple top, with no f-holes and two pickups. Joins Fred Waring and the Pennsylvanians on NBC radio, bringing the sound of the electric guitar to millions of listeners coast to coast. Performs in a White House concert for President Franklin D. Roosevelt. Working weekends at the Epiphone factory in New York City, builds “The Log” by attaching a standard Epiphone neck, strings and wings to a 4×4 board with a pickup. When M. H. Berlin, president of Gibson Guitar’s parent company, takes little interest in this “solid-body,” Paul braces an Epiphone hollow body with a 3/8-inch steel bar, winds his own super-hot pickups and, for a decade or more, uses “The Klunker” as his primary electrified guitar for performing and recording. Moves to Los Angeles with the dream of teaming up with Bing Crosby and replacing the late Eddie Lang, Paul’s guitar idol. Drafted into Armed Forces Radio Service, where he creates V-Disc recordings and AFRS radio shows. Tangles with Nat Cole during the first “Jazz at the Philharmonic” concert in Los Angeles, one of history’s most famous jams. Provides brilliant accompaniment for Bing Crosby’s post-war record hit “It’s Been a Long, Long Time.” Impressed with Paul’s technical wizardry, Crosby urges him to build a studio. Paul soundproofs his garage in Hollywood, where he records the Andrews Sisters, Art Tatum, Jo Stafford, Andy Williams, Kay Starr, Pee Wee Hunt, Andre Previn, Tex Williams, and W.C. Fields. Gene Autry introduces Colleen Summers (Mary Ford) to Paul, who returns to his “Rhubarb Red” persona to perform “hillbilly” radio shows with Ford on NBC. Paul’s mother complains that every guitar player on the radio sounds just like him. Paul leaves tour with the Andrews Sisters and returns to his garage studio in Hollywood for two years of research into echo, overdubbing, phasing, and other recording effects. Emerges from studio with 22 “New Sound” recordings of multiple overdubbed guitars; Capitol Records releases Paul’s first solo hit single – “Lover” backed by “Brazil.” Paul and Ford inaugurate their musical act in Waukesha; en route back to California, their convertible careens off Route 66 during a winter storm. Paul’s right arm is badly damaged and doctors recommend amputation, but Paul persuades them to re-set arm in a crook so that he can continue to play. Bing Crosby commissions Ampex Corporation to produce the first tape recorder, based on the wartime German prototype. Bing gives first Ampex model to Paul, who promptly orders an additional recording head and invents the “sound-on-sound” tape machine. Paul marries Mary Ford and hosts a radio show, “The Les Paul Show,” which airs for 23 weeks. Gibson Guitar Corp. begins work on a solid-body electric guitar and seeks endorsement of the most prominent guitarist of the day. “How High the Moon” and “Walkin’ & Whistlin’ Blues” are chart-busters; Paul and Ford play the London Palladium. Moves to Mahwah, New Jersey, to produce “Les Paul & Mary Ford At Home,” a series of 5-minute television shows (170 episodes) sponsored by Listerine. Release of the Gibson “Gold Top,” the first commercial “Les Paul model” solid-body electric guitar. Invents the “Les Paulverizer,” a remote-control device he attaches below the tailpiece of his guitar to manipulate the taped accompaniment he and Ford used during their White House concert for President Dwight D. Eisenhower. Ampex delivers first operational 8-track recorder to Paul. Capitol Records contract ends as rock and roll pushes Paul and Ford off the charts. They sign with Mitch Miller at Columbia Records. Retires from performing, but not from tinkering with pickup designs and other electronics. Carnegie Hall concert with Bucky Pizzarelli, George Benson and Laurindo Almeida. Mary Ford dies in Los Angeles after lapsing into diabetic coma. Quintuple by-pass heart surgery at the Cleveland Clinic. Receives prestigious Trustees Award from the Recording Academy. Launches a regular Monday night gig with his trio in New York City, first at Fat Tuesdays and then at the Iridium Jazz Club. 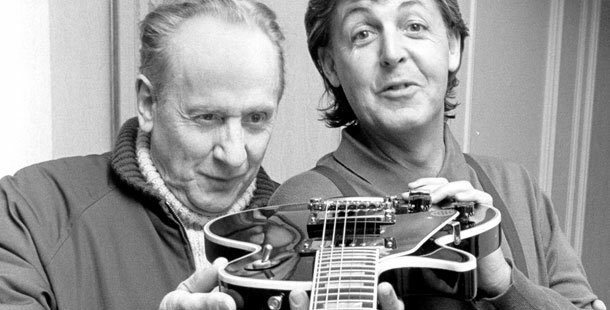 Lauded in a Cinemax tribute, Les Paul: He Changed the Music, with B.B. King, Eddie Van Halen and others. Induction into New Jersey Inventors Hall of Fame; presented The John Smithson Bicentennial Medal by the Smithsonian Institution. Awarded a Technical Grammy by the Recording Academy. Celebrates his 90th birthday with a tribute concert at Carnegie Hall; inducted into National Inventors Hall of Fame; receives Sammy Cahn Lifetime Achievement Award from the Songwriters Hall of Fame. Two 2005 Grammy awards – Best Pop Instrumental Performance (“Caravan”) and Best Rock Instrumental Performance (“69 Freedom Special”) – for Les Paul & Friends (Capitol), his first new album in almost 30 years. Among Paul’s musical partners: Keith Richards, Jeff Beck, Eric Clapton, and Buddy Guy.